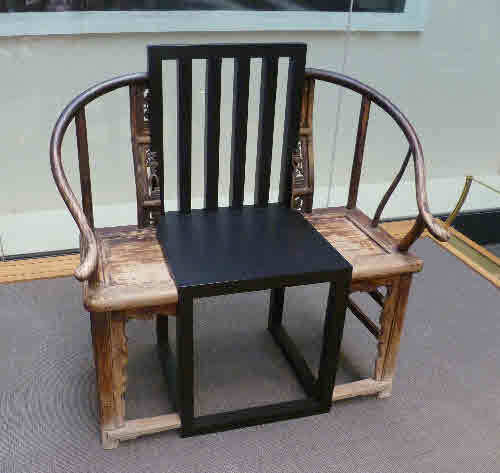 The label says: “This piece is based on a traditional round chair of a kind historically associated with high status”. It fails to make the obvious interpretation that the double throne is a subtle and penetrating comment on the problem of political authority in China today. The Communist Party has inserted its power into the traditional Confucian structure, but the new and old ideological bases of legitimacy are inconsistent, and it shows. Shao Fan did not IMHO get it quite right. The solid part is the old one: the State as a patriarchal household writ large, ruled by the old and wise within a patriotic ethic of filial duty and noblesse oblige. What is rotten is the modern insert. The Chinese CP as the vanguard of the workers and peasants, legitimised by its unique mastery of dialectical materialism, the one and only science of history, and its victory a half-century ago over the Japanese and the Kuomintang? I doubt if you could find a single Marxist true believer or Maoist warrior among those 2270 delegates. So the CP’s authority is based on a modest social contract very like the one that General Motors offers its employees: you work exactly as we tell you in exchange for a living wage. If the wage isn’t paid, or the work becomes too onerous or dangerous, GM’s workers are off the next day. Chinese citizens can’t opt out the same way, but they can go on strike or take to the streets. A recession in a democracy typically leads to a change in government; in China, it could mean the fall of the rÃ©gime. The colourless chemical engineer Xi Jinping will I suppose take over as planned from the equally dull hydraulic engineer Hu Jintao in spite of the hiccups. Next time it will be more difficult. Narrow oligarchies can survive a long time in the right circumstances; think of the Teutonic Knights or the Venetian Republic. Somehow I doubt if these models are really helpful. Meanwhile the termites of Runnymede and the Enlightenment are eating away at the throne, and the peasants are stirring on their blogs and Twitters. This is a stupid and witless statement, James. Yes, criticize the repression and the shortsightedness of not allowing for dissent. But criticizing leaders for being “dull” and “colorless” is idiotic. Would you prefer someone with the flair of Mao? Someone who made himself noticed like Gaddafi? Someone who could work a crowd like Hitler? You’d prefer someone who ramped up the Japan excitement from hurling words to hurling bombs? What China (and the rest of the world) needs is leaders who see their jobs as the “dull, colorless” task of running their countries, not as messiahs who view their role as ushering in the new jerusalem, not as embodiments of the world spirit, not as tasked to give their people whatever they want as long as they are loved; people who specifically prefer numbers and details to the pursuit of glory. So – you’re for Romney? Nice to have a friend here! That strikes me as an odd argument to make. Being an effective leader is not mutually exclusive with having a (positive) vision for your country, and such a positive vision need not be unrealistic. If democracy counts for anything, there’s value in politicians being ready to listen to and empathise with strangers and ordinary people, and make and defend value judgements. The technocratic engineering mindset is a necessary component of a government (as we saw with its absence from GW Bush’s administration). When it’s the only component, there’s trouble ahead. You can’t decide the social rate of time preference to pop into your cost-benefit analysis for solar and coal energy (say) from internal technical logic. It’s exogenous. Are the Chinese leaders good enough technocrats to see that their model can’t work without democracy? I doubt it. Maynard took your original post to contain a baseless slam against the dull and colorless. I maintain that your response supports my alternate theory: That you intended, entirely justifiably, to malign engineers. Not that he really belongs with your list of worthies. Don’t forget the engineer Herbert Hoover, whose empathy and technocratic competence averted what would have been the greatest economic catastrophe ever to hit the United States. And the engineer Mahmoud Ahmadinejad, who certainly has shown he can work a crowd. And Richard Butler, founder of the Aryan Nations, and the rest of the disproportionate number of right-wing terrorists who are engineers. 1. Technocracy can work without democracy, if you can get the right technocrat. Cf. Singapore. The problem is one of finding and replacing the right technocrat. Democracy’s great advantage is legitimate succession. 2. I agree with Maynard’s observation on personality types–some very good democratic politicians have been colorless individuals: e.g., Ike or Angela Merkel. I did not intend “engineer” as a slur. (See this fan piece of mine on one.) It’s a simple fact about the typical education of current Chinese leaders. The “prime minister” Wen Jiabao is a geophysicist. I’m sure the Chinese are better off with technocrats with serious scientific or technical education than with the superficial recipes of Harvard MBAs or the half-understood financial wizardry of Wall Street rocket scientists. Education isn’t fate, and I take your point that MM Hu and Xi have motivations and ambitions that go beyond the ordinary ones of their crafts. But please provide evidence that they transcend the limitations of their professional mindset in their approach to government. I don’t have any problem with the argument that Hu and Xi have a difficult time with value judgments and as narrow a perspective as is possible for a successful politician. I have no priors on these individuals, although it is obvious that the CP is either very bureaucratic-timid or very narrow-minded or both. What that means for the individuals within the CP I cannot say, because bureaucratic behavior is set as much by the internal incentives as the personalities of the bureaucrats. It was the word “engineer” that made me brindle. I’ve calmed down now. The result is that many engineers will note that the Captains of Capital seem to have most of theÂ credentialed support; they must then be correct on policy differences. Contingent outcomes are not so important. And lord knows there’s a lot of capital sloshing around China right now. So I’m with James here.